17th Battalion Manchester Regiment on the Somme | Inspired by interviews and notes by a member of the 2nd City Battalion of the Manchester Regiment, this site portrays the particular group of volunteer soldiers, from enlistment to their service in the Battle of the Somme. In memory of the contributor of the journal, Private Allan Arthur Bell 8055 and the Pals that served with him. Copyright Bell Family. All rights reserved. Please see acknowledgments and feel free to comment in the Guest Book or individual Posts. “It had a leather frame inside, and was issued to all of us some weeks before the big advance on 1st July, 1916. A few days after the initial advance I took my helmet to the Company QMS for renewal as it had a hole in it made by a bullet, which had caused it to roll up like the petal of a flower. “Yer wanna be more careful” said newly promoted ex-Sergt. McM [McMenemy]. Anyhow, he gave me a new hat. Harold Knowlson enlisted in the 2nd City Battalion and received the Regimental Number 8207, in the sequence allocated to men joining the Colours on 2nd September 1914. He had left is job at Simpson & Godlee Limited, Salford and lived with his parents Annie and Charles at 235 Ashton New Road, Beswick. Harold had been born in Ancoats on 8th July 1898. He was 16 years and two months old, despite the minimum age being 18 for Home service. of B Company under the Command of Lieutenant John Greville Madden*1. Private 8829 Eugene Chevalier Royle was another member of VIII Platoon and former employee of Simpson & Godlee Limited. 23 year old Eugene probably joined the Battalion on 3rd September. He served to the end of hostilities until he was transferred to Reserve on 8th March 1919. He received a Pension resulting from a gunshot wound to his Perineum. Harold and Eugene served in the trenches and took part in the assault on Montauban on 1st July 1916. Harold was severely wounded in the battle and died of his wounds on 3rd July. He was buried in Peronne Road Cemetery, Maricourt. This was behind the initial line of assault and close to Regimental Aid Posts, including one based at the former Brewery Buildings. The position of his burial close to the front would indicate Harold had been wounded on 2nd July, as he would have been evacuated further to the rear if his wounds had been earlier. Harold was still 18 years old when he died, five days short of his 19th Birthday and the minimum age for overseas service. One of Harold’s elder brothers, William had also arrived in France on 8th November 1915. William had enlisted as Private 20301 in 22nd Battalion. He trained with V Platoon of B Company, prior to volunteering for 30th Division Cyclists Company. This unit subsequently became XIIIth Corps Cyclists Battalion of the Army Cyclists Corps and William received the Regimental Number 9720. William survived hostilities and was transferred to Reserve on 10th February 1919. The boys’ father, Charles, died in Manchester on 24th November 1916. Another member of VIII Platoon was my great Uncle Pte 8923 Herbert Vernon. This entry was posted in Manchester Regiment on April 5, 2019 by 8055bell. This Post commemorates the men of the Manchester Regiment, killed in the German Spring Offensive, that commenced 101 years ago today. Pozieres is a village 6 kilometres north-east of the town of Albert. The Memorial encloses Pozieres British Cemetery which is a little south-west of Pozieres on the main road, D929, from Albert to Bapaume. On the road frontage is an open arcade terminated by small buildings and broken in the middle by the entrance and gates. Along the sides and the back, stone tablets are fixed in the stone rubble walls bearing the names of the dead grouped under their Regiments. The memorial relates to the period of German Spring Offensive, or “Kaiserschlacht”, in March and April 1918 when the British Army was driven back by overwhelming numbers, and the months that followed before the Advance to Victory, which began on 8 August 1918. The memorial stands on a ridge that can be seen from many vantage points in the heart of the Somme battlefields of 1916. This location seemed a little incongruous to me, as most Manchester Regiment commemorations are men killed near St Quentin – almost 30 miles to the south east. In the centenary year I then learned more about the German successes of Operation Michael, sweeping through the Somme area in May 1918, driving through the retreating 5th Army towards Amiens. The area was then returned to Allied hands in the Advance to Victory. The Memorial commemorates over 14,000 casualties of the United Kingdom and 300 of the South African Forces who have no known grave and who died on the Somme from 21 March to 7 August 1918. The memorial encloses POZIERES BRITISH CEMETERY where 2,758 Commonwealth servicemen buried or commemorated. There is also 1 German soldier buried there. The cemetery and memorial were designed by W.H. Cowlishaw, with sculpture by Laurence A. Turner. The memorial was unveiled by Sir Horace Smith-Dorrien on 4 August 1930. 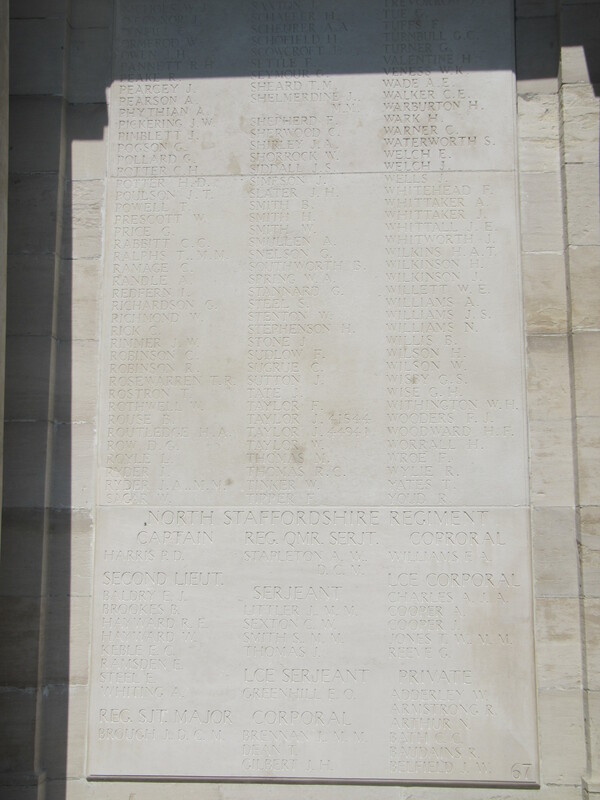 497 casualties of the Manchester Regiment are inscribed on the panels of the Memorial. This includes 48 members of the 17th Battalion. Two Lance Corporals, 8046 Sidney Ackerley MM and 8058 Thomas Barrow, are included in the roll. Their service numbers denote that these men had been some of the first to enlist when the 2nd City Battalion was formed on 2nd September 1914. They also disembarked in Boulogne together with the main part of the Battalion on 8th November 1915. 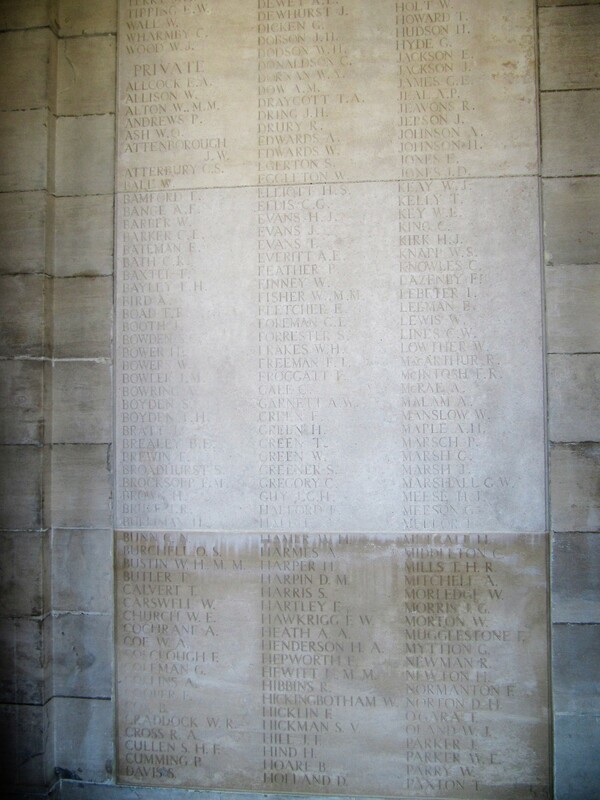 Most of the 17th Battalion inscriptions were men killed in the defences near Etreillers on 22nd March 1918. For most conspicuous bravery, devotion to duty and self-sacrifice during operations at Manchester Redoubt, near St. Quentin, on the 21 March 1918. During the preliminary bombardment he encouraged his men in the posts in the Redoubt by frequent visits, and when repeated attacks developed controlled the defence at the points threatened, giving personal support with revolver, rifle and bombs. Single-handed he repulsed one bombing assault driving back the enemy and inflicting severe casualties. Later, when ammunition was required, he made several journeys under severe fire in order to replenish the supply. Throughout the day Lieutenant-Colonel Elstob, although twice wounded, showed the most fearless disregard of his own safety, and by his encouragement and noble example inspired his command to the fullest degree. He set throughout the highest example of valour, determination, endurance and fine soldierly bearing. 264 members of the 2nd Line Territorial Battalions and 77 casualties serving with 1/9th Battalion are commemorated. These men were predominately on 21st March 1918 on the first day of the German onslaught near Havrincourt. 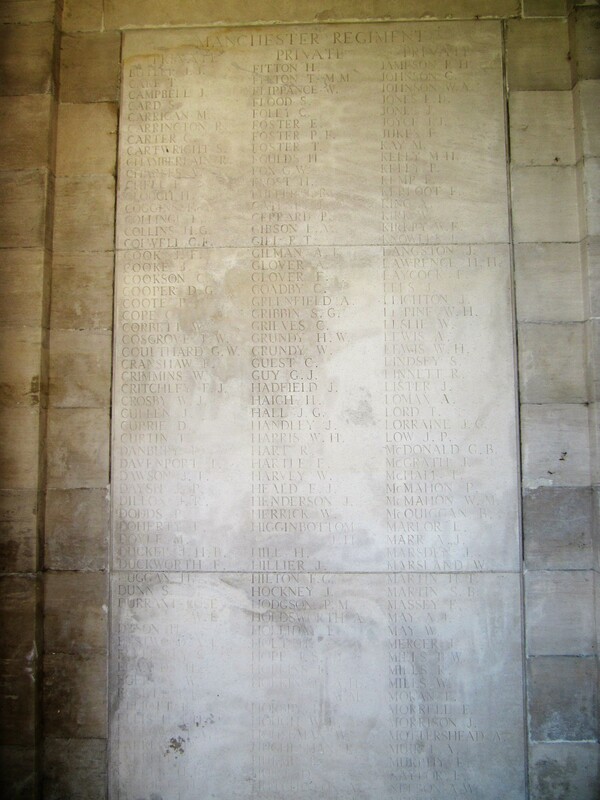 The Memorial is formed by inscriptions of names on the the rear and flank walls of the Cemetery. 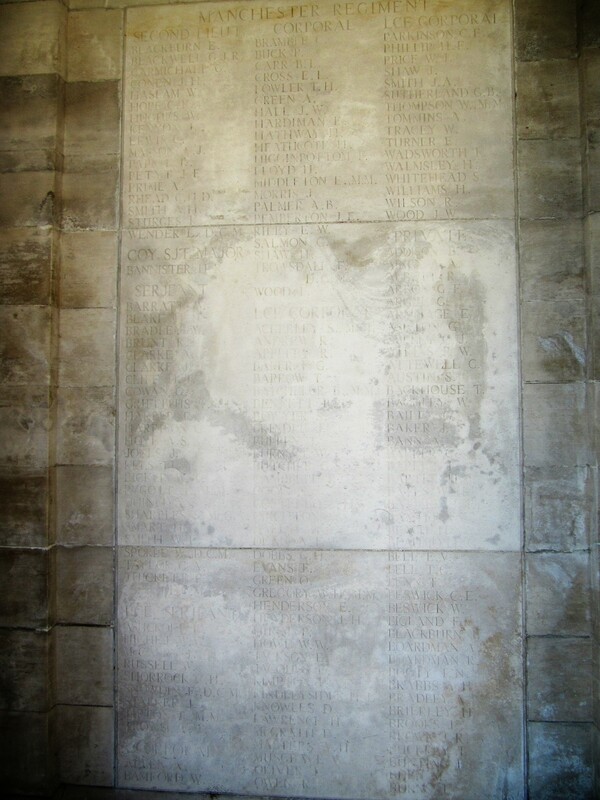 The Manchester Regiment panel are on the right side of the rear wall. This entry was posted in Manchester Regiment on March 21, 2019 by 8055bell. Pte 8230 Alexander (Alec) Mackie (Seated) and Pte 8060 Herbert (Bert) Brown (Standing) Simpson & Son Wharf Road Grantham. Probably taken in Spring/Summer 1915, when the Bttn trained at Belton Park, Grantham. Courtesy Stuart Brown. Alec was killed at Flers on 11th October 1916. 8060 Pte Herbert (Bert) Brown (3rd from Left) probably with other members of V Platoon. Training at Heaton Park in tram Guards uniforms 1914. One of the new huts can be seen behind the group. Private Herbert (Bert) Brown 8060 on Guard Duty at Heaton Park; October 1914-January 1915. Bert was prompoted to Sergeant and attached to 90th TMB. HE was killed near Manchester Hill on 21st March 1918. Courtesy Stuart Brown. V Platoon, B Company of 17th Battalion Manchester Regiment. 101 years ago today, Sgt Bert Brown was killed near Manchester Hill, attached to 90th Trench Mortar Battery. Stuart Brown has provided this Guest Post with a strong narrative on Bert and some wonderful photos. Sharing these resources produces some real gems for the wider project. Small aspects of clarifcation include more understaning of an MC Citation and larger gems are photos of mostly otherwise unknown members of the Battalion. The Centenary of 42 year old Percy Grundy’s death in Germany. Remembered here. 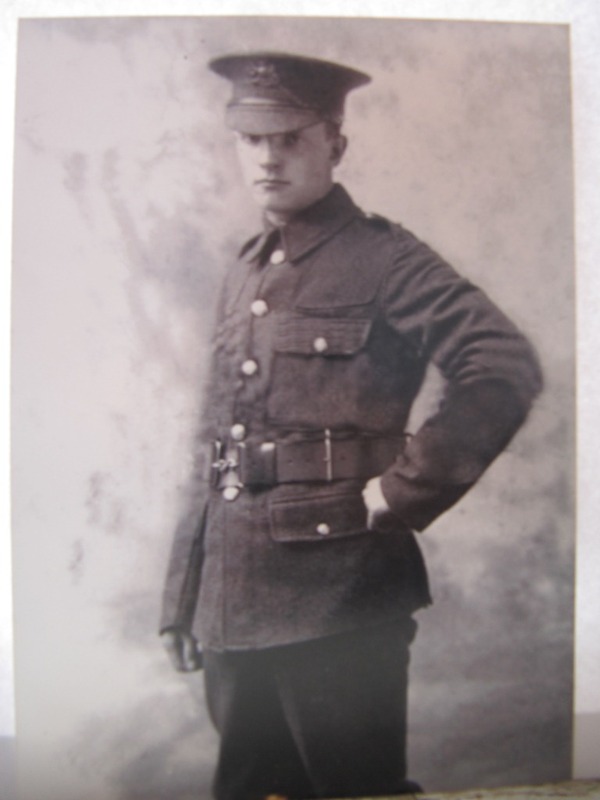 Percy Grundy was one of the 17th Battalion casualties who has not been readily apparent in records, being shown as serving in the Labour Corps or 3rd Battalion Manchester Regiment. Percy died on 1st February 1919, aged 42. He is buried in COLOGNE SOUTHERN CEMETERY with the inscription “At Rest” paid for by his father. This post remembers Percy alongside other Pals in the 2nd City Battalion. This entry was posted in Centenary, Manchester Regiment and tagged Centenary, Manchester Pals, Manchester Regiment on February 1, 2019 by 8055bell. Oscar was born on 6th March 1894 and attended Seamon’s Moss School. His parents were Michael and Martha Ann Hetherington, who had married in September 1889. Michael was employed as an Architectural Draughtsman and the family had two other children, Benjamin and Eva Carradus. They lived at Whitefield Road, Ashton-on-Mersey. After leaving school Oscar gained employment at the Co-operative Insurance Service, where he worked as an insurance surveyor from 1910. He was 5’7” tall, weighed 127 pounds, having blue eyes and red hair. Oscar attended the Baptist Church. Oscar enlisted in the 2nd City or Pals Battalion of the Manchester Regiment on 3rd September 1914. He became Private 8649 and was posted to XV Platoon of D Company. The Battalion was taken over by the War Office and renumbered as 17th Battalion. 17th Bttn XV Pln. 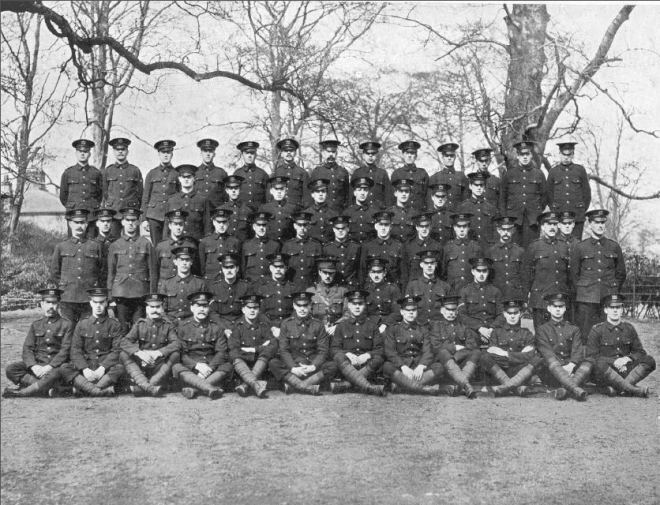 L Cpl O M Hetherington is in the front row, second from the right. Oscar was appointed unpaid Lance Corporal on 9th January 1915 and was paid in this rank from 21st July 1915. He disembarked at Boulogne in France, with 17th Battalion, on 8th November 1915. On 14th February 1916 Oscar was found guilty at a Court Martial of being Absent Without Leave on active service. He was sentenced to three months Field Punishment No. 1. The sentence was suspended on 5th March and overturned 30th May. He returned to serve with the Battalion, losing his stripe and reverting to the rank of Private. There are no detailed records of Oscar’s particular offence, or explanation for his reprieve. It is confirmed that Desertion was a separate – more serious – offence. In the six weeks previous to his Court Martial, 17th Battalion had been serving in the Somme trenches, near Maricourt and Vaux; with periods of rest in billets at Suzanne. Oscar must have been identified as being absent from the post where he was expected to have been present. Oscar was wounded on 5th May, when D Company had been defending the trenches in Vaux Wood. On this day Private 8563 Harry Foden of Oscar’s XV Platoon was killed by shell fire, when he was on sentry duty. Oscar was probably wounded at a similar time, along with three other members of the Battalion. Harry was buried in Suzanne Communal Cemetery Extension and Oscar was evacuated Home, arriving on 12th May 1916. Following treatment, Oscar was transferred to 25th (Training Reserve) Battalion at Altcar on 11th August 1916. On 1st September he received a posting to 69th (Training Reserve) Battalion, although this was subsequently cancelled. Oscar was transferred to No 8 Officer Cadet Battalion in Lichfield on 4th November 1916. He was commissioned 2nd Lieutenant on 1st March 1917*1 and posted to 19th Battalion on 14th March 1917. His arrival in the field is not identified in the War Diary. From 4th April 1917, his Commanding Officer was Lieutenant Colonel Charles Leslie Macdonald, who had previously been Officer Commanding D Company, in 17th Battalion. 19th Battalion were training near Beaumetz and later moved to Arras, where they took part in heavy fighting during April 1917. Oscar was wounded in the opening of the Passchendaele offensive on 31st July 1917. After treatment in France for wounds to his left shoulder and buttock, Oscar evacuated Home again. After recovery Oscar was posted to 3rd Battalion and attached to the Royal Air Force on 7th November 1918. He was posted to 14 Training Squadron and didn’t return to France. He was promoted to Lieutenant on 1st September 1918 *2 and served in various Training Schools. He appears to have spent two week in Hospital in Hull during August 1918 and is known to have flown nearby in Beverley. There are records indicating Oscar was unfit for general service from July 1918. He returned to 3rd Manchesters on 11th April 1919. Oscar is recorded as attending Aberdeen University to study Science in 1919. On 27th February 1920 her sailed from London for Madras in India on board SS Chindwara. He worked on a tea plantation at Seni Kundara, Valaparai in South India. Oscar relinquished his commission on 1st September 1921, but re-applied for a commission in the India Reserve of Officers on 6th June 1928. He held the rank of 2nd Lieutenant in the Indian Army as an Emergency commission on 18th August 1942. Oscar must have visited England in 1926, when he married Kathleen Dearnley in North Cheshire. Oscar and Kathleen returned to Plymouth from Bombay on 28th October 1945. He held the rank of Captain served as a Recruiting Officer. On 18th August 1946, Oscar was living at Northenden Road, Sale. He sailed to Jamaica from Bristol on board SS Aiguani on 18th August 1946. He travelled without his wife, intending to take up up the position of an estate manager. Having returned to England, Oscar sailed for Jamaica again on 15th September 1946, on board SS Atlantis, from Southampton. At some stage Oscar wrote a speech about Military leadership. He provided an interesting anecdote about his Officer Commanding setting the example of bravery under fire. The officer had ordered his Company to take cover under German artillery fire, yet he had remained on his horse. When Oscar led his Platoon near Ypres, similar circumstances arose. He believed he was riding the biggest horse in the Army and somehow managed not to fall off. Oscar died in Alverstoke, Hampshire in January 1978. Kathleen died in 1997, aged 91. Younger brother Benjamin enlisted as Private 3451 in 6th Battalion Manchester Regiment on his 18th Birthday; 3rd May 1915. He embarked to join 1/6th Battalion on 8th October and disembarked on 23rd October 1915. Ben may have been a reinforcement in Gallipoli, or possibly served in Egypt where he was present in January 1916. The Battalion subsequently arrived in France during March 1917. He was gassed in August 1917 and appears to have been evacuated Home. The Territorial Battalions were renumbered in 1917 and Ben had received the new Regimental Number 250997. Ben was commissioned in the Territorial Force of the Manchester Regiment on 9th October 1918 *3 and subsequent to the Armistice, he was posted to 9th Battalion in France. Ben lived at his parent’s address in 1921/22. Eva Carradus Hetherington served in the Voluntary Aid Detachment. Eva joined the Red Cross in July 1916 and left on 28th February 1919. Eva was a nurse at the 98 bed Hospital at Heyesleigh annexe, Pickering Lodge, Timperley. She married Robert Stephenson Hamilton Irwin in 1924. Robert had served in the Royal Welsh Fusiliers and Kings Shropshire Light Infantry. Eva died in 1980. Caroline Wilson – Oscar Hetherington’s grandaughter. This entry was posted in Manchester Regiment on November 18, 2018 by 8055bell. Wilfred Owen enlisted in the Artist’s Rifles and received his commission in the 5th Battalion Manchester Regiment. Wilfred was attached to 2nd Battalion and was awarded a Military Cross for bravery. Wilfred Owen wrote extensively and produced some incredible war poems that still resonate to school children and adults on the anniversary of his death. The poems provide an insight into life and death on the Western Front and the realities for an infantry soldiers. This entry was posted in Manchester Regiment on November 4, 2018 by 8055bell.